Forecasters say a community rating mandate may raise prices for up to 65 percent of small groups. Forecasters say a Patient Protection and Affordable Care Act pricing rule may increase premiums for 65 percent of the affected small groups. The effects of the PPACA pricing rule on large-group plans will be negligible, the forecasters say. Analysts at the Office of the Actuary at the Centers for Medicare & Medicaid Services come to those conclusions in a new report to Congress on the effects of PPACA private health insurance requirements on group health premiums. The CMS is helping its parent, the U.S. Department of Health and Human Services, with the department’s share of PPACA implementation. 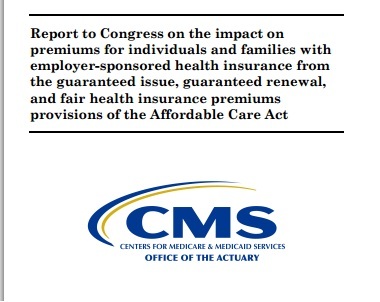 The CMS actuarial office prepared the PPACA impact report to comply with a provision in a 2011 appropriations act. PPACA includes many provisions that could affect group health prices either directly or indirectly. In the new report, the CMS actuaries looked only at the effects of the PPACA Fair Health Insurance Premiums section. The fair premiums section requires insurers in the small-group market to offer coverage on a guaranteed-issue, guaranteed-renewable basis, with an adjusted community rating system. The fair premiums section exempts large groups. Because the Health Insurance Portability and Accountability Act of 1996 already required insurers to sell small-group coverage on a guaranteed-issue, guaranteed-renewable basis before PPACA came along, the community rating requirement is the only fair premiums provision likely to affect small-group rates, the CMS actuaries say. The PPACA adjusted community rating rules let carriers charge up to three times more for coverage for the oldest insureds than they charge for the youngest, but insurers can no longer use gender, health status or claims as rating factors. Independent experts told the CMS actuaries that they thought the community rating rules would increase rates for about 60 percent to 67 percent of the fully insured small groups subject to the new rules. For the plans with increases, typical mandate-related increases could be about 5 percent to 20 percent, the actuaries found. That increase in employer premiums could lead to increases in the employees’ premium contributions for 11 million of the 17 million people who have fully insured small-group coverage, the actuaries say. In the real world, the effect will probably be much narrower this year, because so many small groups renewed coverage early and are not yet affected by the PPACA requirements that took effect Jan. 1, actuaries said.